It’s a date that many of us thought we may never see, but Oculus did reveal that Rift will be released early next year. As for specific price points…there are none. However, several sources were reporting that no one should expect to pay more than $1,500 for the headset. Oculus is partnering with Microsoft to provide users with an Xbox One Windows 10-compatible wireless controller and adapter when they purchase Rift. Users will be able to stream Xbox One games to the device, and Oculus is already pledging $10 million to developers in an effort to have community-created games available. According to head of Xbox Phil Spencer, games such as Sunset Overdrive, Forza, and Halo are expected to be available for streaming. Some forums are complaining, not surprisingly, about the exclusivity of Windows 10 as the main driver of the headset and controller. It should be noted however that while the Xbox One controller’s wireless capability is compatible only with Windows 10, it can be wired into previous versions such as Windows 7 and 8.1. It wouldn’t truly be virtual reality without the ability to reach out into simulated worlds, and Oculus Touch will be the next step forward. Oculus Touch acts as a sort of super-minimalist controller that users can wrap around their hands and perform a multitude of gestures that built-in cameras and sensors will pick up on. There doesn’t seem to be any suggestion that Oculus Touch is part of the package that customers will be able to purchase, but that it will rather be sold separate. Like Rift, no exact price points have been revealed yet. 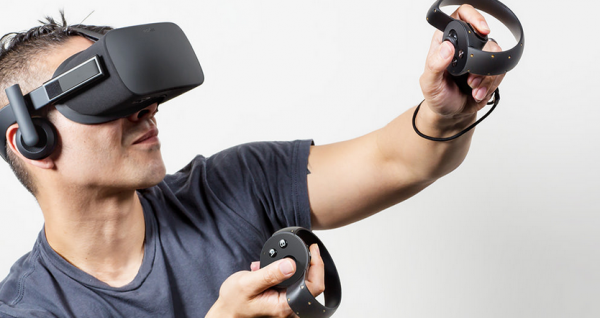 Despite the hopes of many, Oculus Rift’s headset will not be wireless. It requires a USB connection into a PC (from where it is streamed). According to Gizmodo, Oculus recommends that players sit down during play rather than walking around as well. Some might see the requirement to plug in as a sort of backwards limitation of what makes virtual reality what it is, but one can only assume that it won’t be plugged in forever. Oculus did consider the fact that not everyone’s eyes are the same. For one, users will be able to adjust the interpupillary distance, or IPD, so that it matches up to the distance between two eyes. Each eye will view an OLED screen, providing a fluid image without interruption. What started out as a Kickstarter campaign has certainly come a long way in the world of virtual reality. With the mass amount of funding that Oculus seems to work with, we can only expect Rift to just be the tip of the VR iceberg. Michael Cartier is a Raleigh, NC-based writer in tech, home entertainment, music and more.